Should you consider seeking God for wisdom? Have you ever felt overwhelmed in your decision making? Perhaps you were at a place where life felt unbearable. Have you ever experienced situations that threw you out of your comfort zone and left you wondering how you were supposed to handle life, live with joy, or even move forward? If you know this feeling or have experienced it for only a short period of time, then you have also wondered how you could acquire the wisdom that you need to move forward in life. You may not have contemplated these words exactly, but you have tried to determine the steps that were necessary to make good decisions in your life. You began, in some way, to seek wisdom. This may cause you to feel a bit distraught because everyone else seems to have it together, but the truth is that everyone is searching for wisdom. They are searching in books, movies, people, social media, and in so many other places. However, there is one place where we, as people should turn first. We should turn to God. Yet, many don’t because they believe that it is inconceivable to ask the Most High God for wisdom. They wonder if He would even consider their request. For this reason, they continue to utilize the wisdom of men. 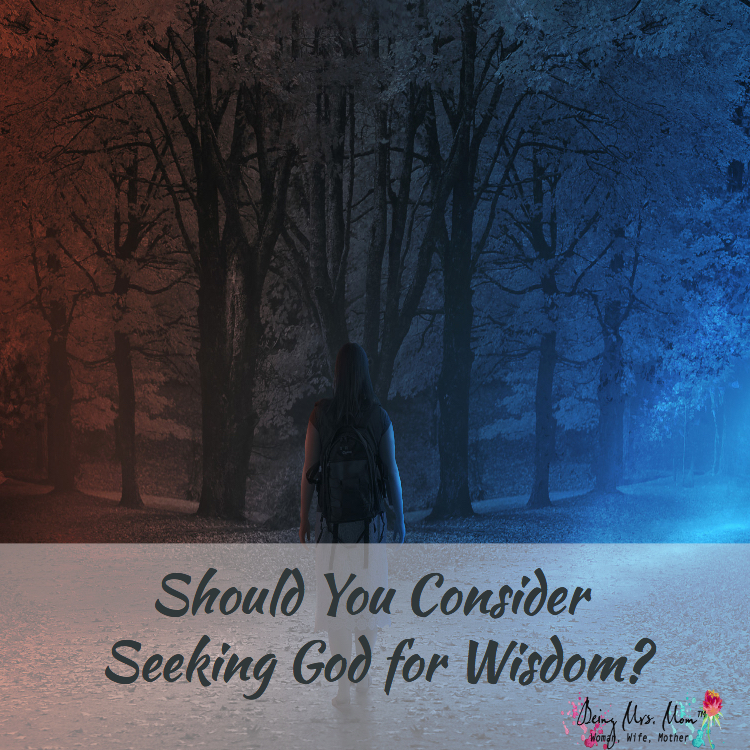 Should you consider seekingGod for wisdom? The wisdom that comes from men, that is mankind, is sensual and wicked. It derives from the flesh and stirs up strife. If you want to know how to destroy your life and relationships, just seek the wisdom of ungodly people, who have no desire to seek God or encourage you to do so, either. That being said, if you desire to be successful in life and to have some sense of fulfillment, you must turn to the Lord. When you do, He will give you wisdom and send people your way that are full of godly wisdom, as well. I know I’m doing a lot of talking on this topic, but let’s visit the Bible for a moment to get clarity on the subject. Have you ever heard of Solomon? He was the son of King David. Prior to his birth, his mother and father had a child that died, due to the sins of his father. As a result, his father promised his mother that he, Solomon, would be the successor of his thrown. However, there was a problem. David had other sons that were older than Solomon. They wanted to be king and had no knowledge of the promise that had been made to Solomon’s mother. Just before King David’s death, while bed ridden, one of his son’s took it upon himself to establish his kingdom, and in his father’s name. Solomon became aware of this fact, but he remained patient because he loved the Lord and kept the statutes of his father, a wise man. (1 Kings 3:3). In 1 Kings 1-3, we see the situation unfold, where God sent the elders to work out the situation for Solomon. As he waited on God to establish his place on the thrown and his father to fulfill his promise to his mother, and essentially to him, he simply trusted God. When the kingdom of Solomon was established, he was a young man. He had to be younger than 30 and some believe that he could have even been 12 years old. Can you imagine what it would be like to rule over a kingdom as a young person? I don’t think that overwhelming explains how he may have felt at times. Yet, this is how he handled it. One translation says that he asked God for an “understanding mind to govern.” This type of request takes great humility, but it also takes great faith in God. Solomon clearly felt that he was incapable of fulfilling the call of king on his own, thus he did what he knew his father, a wise man of God, would have done. He asked of God. Now if God gave Solomon the wisdom that he requested, you have to know that He will also give it to you. He doesn’t look at you or me and determine that He isn’t going to give us wisdom. His word says that if we are lacking wisdom, we are supposed to turn to God and He will give it to us. What is required to be able to ask? Sure! I understand that you aren’t seeking God to rule over a people as queen. You may be asking Him for wisdom in your marriage, finances, or as a mother. Perhaps you desire to be wiser in life. Please make sure not to minimize your request because you aren’t being crowned as a queen. You don’t have to be in a specific earthly position to ask of God. You just need to have the position of a humbled heart. Today, I want you to take a moment to think about how you have struggled in your mind and decision making. It is important that you and I take the time to realize that without God, we fail miserably. People that don’t have godly wisdom may appear to be successful, but the truth is that they are miserable and striving to achieve pleasure that will sustain them for a mere moment. This earthly wisdom leads them down a path of destruction. You and I cannot be like the people of the world. We are called out and set apart, so we have to do things differently. We have to seek God for wisdom. When we do, He is faithful to supply wisdom and godly resources that are full of His wisdom. If you feel lost and confused, turn to God. If you are unsure and afraid, turn to God. If you need wisdom and direction, turn to God. He is faithful and will respond to your request because He loves you and wants you to succeed more that you do. If you are still wondering if you should consider seeking God for wisdom, you know my answer. Don’t hesitate! Seek God for wisdom today.